Hard to believe it's my 35th week, but at the same time this last 5 weeks is going to drag by EXTREMELY slowly ha. No fatty front view this time. ha. Yesterday was my 35 week check up. I was supposed to have the test for Group B Strep, but my Dr. changed his mind and decided that would be next week. I was ok with that. BELIEVE ME, I am not fond of these last few appointments. Weight: 167 lbs. I have gained 32 lbs so far. Triple UGH... mainly because I still have 5 weeks to go and wouldn't put it past myself to pack on another 10 lbs. My appointment was short and sweet. Nothing major to relay except that I asked my Dr. if he thought this baby was bigger than my other two. He didn't say "maybe"... he didn't say "I don't know"... without hesitation, he said yes. ha ha ha. Nice. How much bigger remains to be seen... however, I am blaming this all on Dave. I was a 6 pounder when I was born so it's not my fault ha. My other two were a few ounces shy of 8 lbs. If this one is going to be in the 9-10 lb range, CUT ME OPEN... ha ha ha. I kid... no, but SERIOUSLY! ha. I really am kidding though. I would rather push out a big baby than have a c-section. Not too fond of the idea of being sliced open. I am having TONS of contractions! Mostly Braxton Hicks, but with Brendan I didn't experience these until 36 weeks. So to have been contracting basically since week 32, it's been crazy. Sometimes they get to where they feel crampy like real contractions but they aren't time-able and they aren't close enough together to cause any concern. What will be highly irritating is to have things go like Brendan did... which is having all these contractions, but NOTHING to show for it by way of effacement and dilation. I am hoping next week I will get the news that these contractions aren't in vain and that they are actually doing something worth while besides making me uncomfortable ha. Some things to share. I have been getting some of the main baby items in. I set up the play yard. It's super cute. It is one with a bassinet... do they even make these things without bassinets anymore? It also has a changing station which I think is AWESOME! I got my electric breast pump. I got the Phillips Avent Twin Electric Pump. On my way to become a full fledged dairy cow. HA! I have always felt like that with nursing. Some moms can focus on the cuddly, lovey, mommy/baby bonding of it, but me, I just feel like a dairy cow. Anyway. Looking forward to Monday. HALLOWEEN! woo hoo. Still have no clue what I will dress the kids up as or where I will take them trick or treating, but it's always a fun time. Also looking forward to Tuesday. Why? Well. Because I am not getting any smaller and I have NO CLUE for sure when Avery will decide to make her appearance, I am setting my Christmas tree up the day after Halloween. :) I am excited. Well. That's it, that's all. Happy Thursday and Happy Weekend! I have to post this early because this is moving week. I won't have time to post it tomorrow. Tomorrow I will likely be too busy getting last minute packing done. Besides that, I needed to get my picture taken so I can pack up my camera gear and get it ready to transfer to the new place :) Yippee. and what I like to refer to as the "fatty front view" ha ha ha. It keeps me grounded. I am doing well. Just dealing with the emotional roller coaster that is pregnancy. I am extremely uncomfortable. My belly gets in the way of everything which is difficult because we are moving ha. POOR DAVE! He is doing the bulk of the packing. I am contracting quite a bit. Some braxton hicks (practice contractions) and some real ones that can be pretty intense. I am hoping they are changing my cervix a little bit. I am easy to make cry, make grumpy, or just plain irritate... which is probably annoying to my friends and family... but I love them anyway, so they better do the same for me! I am hungry all the time it seems. Last night I wanted chocolate so bad I almost cried because we just don't have the money to go out and take care of my cravings on a whim. I decided to make myself a glass of chocolate milk and some toast at 9pm. HA HA HA. So. Yeah, this weight I am putting on is well earned. I hope Avery is satisfied! ha. This weekend is going to be so busy. Friday is moving day. Friday night will be spent getting all the stuff switched over from this place to the next. It's going to be a tough day but it has to happen. I have a partial wedding to photograph on Saturday. Some long time friends of mine are marrying off their first born. It's been a while since I have photographed any part of a wedding so I am looking forward to it. That's about it. I hope you all are having a great week so far. Hope that you all are getting in the Holiday spirit. Halloween and Thanksgiving are my two faves. I am a happy girl during fall. 33 Weeks and Feeling HUUUUUUGE! Here it is, my 33 week belly pic... Glad to have a good camera to take the pics. Doctor appointment was yesterday. It was pretty much a filler appointment. Nothing major. My fundal height is measuring 35 cm. For those of you who have no clue what that info means, basically your fundal height in cm should match your weeks pregnant. I am 33 weeks FYI. Does this mean anything about anything??? I doubt it. I am trying not to get my hopes up that it may mean that I will have the baby 2 weeks sooner ha. That would be LOVELY though. ha. I will say that Bren and Lindsey always measured spot on with fundal height and weeks pregnant. Well. It is official that I did not make my weight goals this pregnancy. I am tipping the scales at 164 lbs. That's a 29 lb gain so far, 5 more lbs and I will be at the weight that I delivered Lindsey at. I HIGHLY doubt that I will be able to only gain 5 more lbs for the rest of this pregnancy, so I am resigning myself to at least end this at 175. UGH. Oh well. Still less than my ending weight with Bren, so I'm trying to look at the bright side. I've lost it before I can lose it again. Have a happy rest of the week. Eat something yummy. So Much to Tell You: 32 Weeks. The CRAZY MONTH has started. I love October, don't get me wrong, but there are going to be some crazy busy days ahead. Some news: (Probably won't interest you if you aren't into SLR cameras, so if you aren't interested just skip this paragraph and the next two) We had a bunch of expenses arise, so this photog had to do some equipment purging and downgrading to make ends meet this month. Sold my wide angle and my 100mm which I loved, but hey, it got us a new windshield and new tags on our car for 2 years. It also replaced Dave's dying phone. We kinda expected the windshield to be covered under warranty but we couldn't find the receipt and the company couldn't find us in their system so we had to pay for it. This led to the selling of my 7D. I bought the 7D on a whim. Camera companies are always coming out with the bigger and better SLR and it's hard to not be tempted by all of the "candy" out there... which is EXPENSIVE "candy" by the way. I loved this camera, but always felt like I was waisting it's capabilities. I don't use the video feature, which is the main sell of this camera. The less expensive sibling to the 5D Mk II but supposedly quality to rival. Still a $1600 camera body for a girl who isn't even doing photography as a business anymore, didn't make much sense to me. We needed a couple hundred to make the kid's birthday happen this weekend so I sold my camera for most of what I paid for it YAY. I am really excited to say that I won't be camera-less for long. 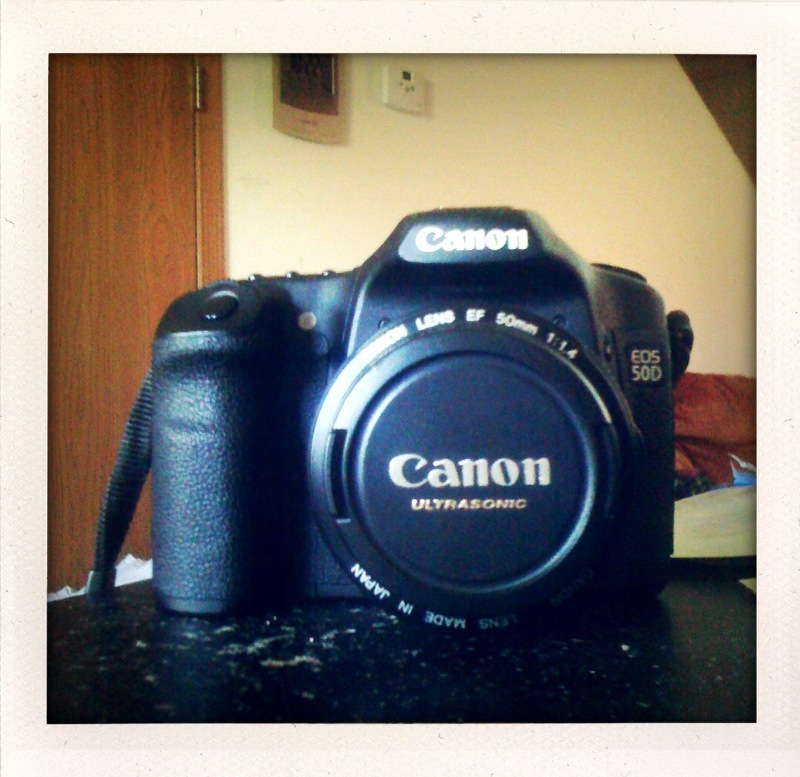 I found and purchased a used Canon 50D at a great price with a 90 day warranty! The 50D is the camera that I shot with before the 7D. It was perfect for me. Now that I think about it, it was very silly of me to upgrade in the first place. 15 megapixel, expandable ISO capabilities, high max shutter speed... NO VIDEO which I LOVE! I am kinda snobby as it pertains to video on SLR's... I think that it's cool to have the option on some of the models, but I wish they would make models without video for us that STRICTLY do still photography. I am not a cinematographer, I am a PHOTOgrapher. To sum it up for you, I am excited to have this baby back next week. Moving on. Pregnancy. 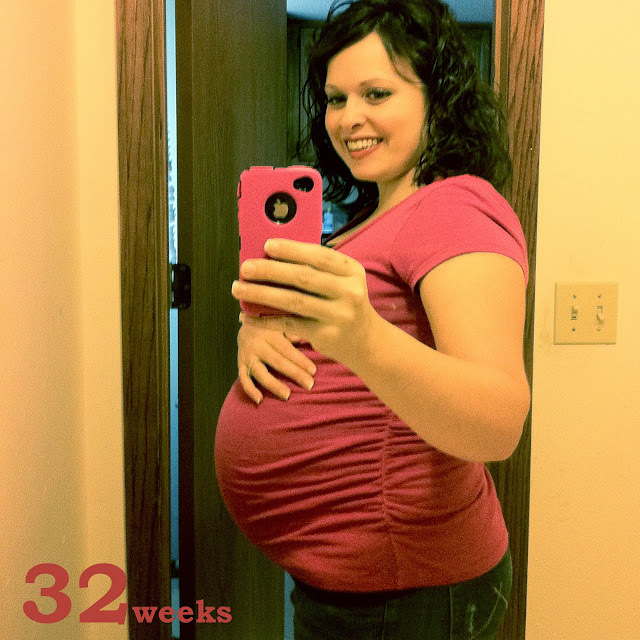 I am 32 weeks! I had my epidural interview on Tuesday which was LOADS of fun (sense the sarcasm). I am doing well. Walks have slowed down. Not enough hours in the day anymore and when I do walk, my body yells at me for it. I am finding it very difficult to do things, though. Between my lack of energy, the distractions of money issues, the big belly that I find obstructing my every move, and the aches and pains that go along with a growing expanding body... I'm just ready for these last 8 weeks to fly by. I'm so excited about them!!! 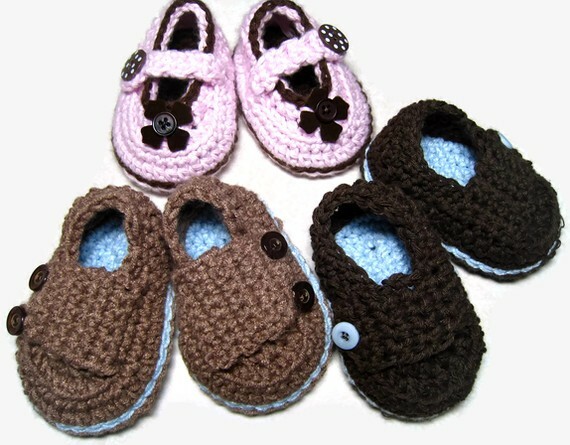 The cute factor was almost overwhelming while I was crocheting them! ha. Anyway. Due to the selling of my camera and waiting for my 50D to arrive, I am forced to do my 32 week belly picture the "old fashioned" way... with my iPhone. ha. So here is my belly! My facial expression is funny because the whole time I am taking this picture I am thinking "OH MY GOSH! MY BELLY IS HUGE!!! AND SO AM I!!!" ha ha ha. I'm ok with it though, because I know there is nothing I can do about this fact. I can only just laugh and hope that I can shed it once I am through with this crazy journey. Did I mention I only have approximately 8 more weeks!? Well, I hope you all have a wonderful Thursday and a GREAT weekend.